Cheetah pictures featuring this superbly streamlined cat up close and in full figure. To capture the ultimate cheetah image - a shot of this sleek cat running at full speed - must be high on the wish list of every aspiring wildlfe photographer. 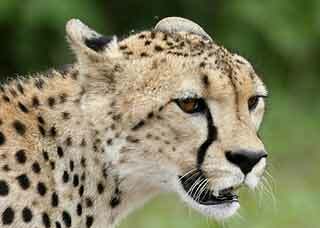 After all, the cheetah is the fastest land mammal on the planet, reaching top speeds of 90 - 112 kph (60 - 70 mph). Heck, if I saw a cheetah sprinting at full tilt, I'd savor the moment and not even worry about lifting my camera! But their blinding speed is not the main reason it's hard to capture exceptional pictures of these elegant cats. 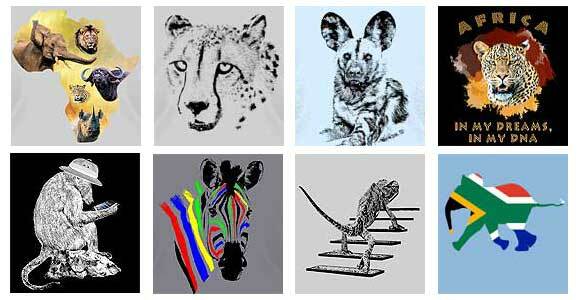 If you love African wildlife, click below to check out our exciting range of Wildlife T-shirts and Apparel available from Amazon.com. The unique designs, based on original wildlife photographs, range from bold and striking to subtle and understated. Have a look! The harsh reality is that cheetah, once widespread through Africa, Asia, and India, are now perilously endangered, so you don't get to see them very often. In South Africa's huge Kruger National Park, there are about 10,000 elephant and 25,000 buffalo. Lions? About 2,000. Leopards? A thousand. But there are only 200 cheetah. Unlike most other cats, cheetah do hunt by day, which improves chances of spotting them when on safari. The terrain is also important and your photo opportunities will be better in flat, open savanna than in hilly or forested areas. The plains of the Serengeti and Masai Mara provide good hunting grounds for cheetah, while the shorter grass makes it easier for tourists to find and view these graceful, streamlined predators. If you're lucky enough to go on safari in Tanzania or Kenya, look out for that classic shot - a cheetah on its haunches on a termite mound, scanning the open plains for potential prey. See also Cheetah Photos Bonus page for older images of cheetah and, for more about these endangered cats, see Cheetah Information and Cheetah Cubs Practice Hunting Skills.